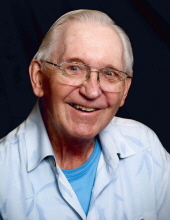 Duane H. Larsen, age 87, of New Hampton, IA passed away very peacefully on Wednesday, March 20, 2019 with his wife and grandson, Eric, by his side at New Hampton Nursing and Rehab. A memorial mass will be held at 10:30 AM on Saturday, April 6, 2019 at Holy Family Parish in New Hampton with Father Brian Dellaert celebrating. Burial will be at St. Mary's Cemetery in New Hampton. Visitation is scheduled from 4:30-6:30 PM on Friday, April 5, 2019 with a 6:30 PM Rosary at the gathering space located at Holy Family Parish in New Hampton and will continue at the gathering space one hour prior to the memorial mass on Saturday. Online condolences for Duane's family may be left at www.conway-markhamfh.com. In lieu of flowers memorials may be directed to St. Jude's Hospital, St. Joseph's Community School or a charity of your choice. Duane was born to Louis and Anna (Doede) Lar\sen in Valley City, ND, where he attended school. Duane was married to Ardis Hoffart on June 8, 1954 at St. Catherine’s Catholic Church in Valley City. To this union four children were born, Pamela, Jeffrey, Gregory and Steven. In 1952, Duane was drafted in the US Army and was honorably discharged in 1954. The couple then moved to Minot, ND where he worked for Red Owl from 1954-1958. They then moved to Jamestown, ND from 1958-1961, Fargo, ND until 1974 and settling in New Hampton, IA when they purchased the Jack and Jill. A few years later they added a second location in Osage, IA which their son, Greg managed. To send flowers or a remembrance gift to the family of Duane H Larsen, please visit our Tribute Store. "Email Address" would like to share the life celebration of Duane H Larsen. Click on the "link" to go to share a favorite memory or leave a condolence message for the family.